I was super psyched to find this online. I haven't seen one in person, but that doesn't really matter. The Eames Elephant is super new, it was first produced by Vitra in March 2009, and super old, it was designed by Charles & Ray Eames in 1945. I'm a huge fan Eames's design, so simple, so beautiful, so classic and so comfy. Their molded plywood chair, sometimes called chip chair, is my fave. You wouldn't think it but it's super comfy to sit in. I wouldn't really do them justice in this post so check their wikipedia page if you're not familiar. Any way in 1945 Ray & Charles Eames created 2 plywood elephants of molded wood. They were never mass produced. 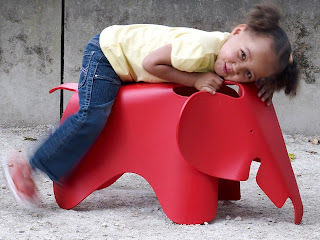 This year Vitra recreated the elephant in plastic and in 5 matte finishes. It can be a chair, a toy or just a friend to your little one. Read more at the Vitra site, they have more great images, or head to Design Public to pick one up. And to my family, I really want this so just put a green one in your cart, pay for it and don't look at the price. Thanks. I finally got one of those Eames molded plywood chairs a couple of years ago, after lusting after them for years prior. You're absolutely right about it looking less comfortable than it is. I always say the same to folks who've never encountered/sat in one before. Did you see the Charles & Ray Eames stamps the Postal Service issued last year? Of course, then the USPS raised postage rates. Sticking some terrible 2-cent stamp next to one of the Eames' designs tarnishes the aesthetic a bit. I don't have the chip chair because I'm not sure where it would live in our house...sad. Saw the stamps, didn't get them because I never use them and any I've gotten to save wind up getting scrunched up in drawer somewhere.